After the initial huge interest in our article on teacher training and left-handed children, we asked Club Members to pass our survey form onto the teachers at their childen’s schools to get some feedback. We wanted to know what guidance the teachers had received during their training and what policies and practical help are being used in schools. So far we have had a very muted response, so maybe this is an issue that parents are superficially concerned about but not enought to be worth actually doing anything about? Or maybe it is the teachers that do not want to get involved in changing things in this area? We have reviewed all the surveys submitted online and added those that were posted to us and we have a toal of 50 submissions that have enough usable information to make them worth including in our results. We would like to thank all the parents and teachers who have taken the time to participate and we really value your views and contributions. A special mention goes to Joanne in Cornwall, UK who managed to get 3 different schools to complete the survey. This is not intended to be a scientific or statistically valid analysis as it is not a large or randomly selected sample, but we hope it gives some insight into the issues about teacher training and left-handed children. The vast majority had no policies in place regarding teaching left-handed children and we did not receive any supporting documents. 87% thought it necessary to give left-handers special guidance but reflecting comments we have previously received one person thought it was damaging to give any special assistance and lefthanders should learn to get by one their own, e.g. by having to use right-handed scissors because they would not always have left-handed ones available. 88% said they had received no guidance at all during their teaching career in schools. About half of the teachers said they did give specific guidance to help left-handers with writing (though more than half of the people who said that were also left-handed themselves). A majority of the right-handed teachers said they were not aware of any specific guidance or the need for different approaches to writing for lefthanders. Most teachers recognise the problem of bumping elbows and the need to sit left-handers on the left side of shared desks. About 30% said they have writing aids in school that help lefthanders, but a lot of them said that either they or the parents had supplied them themselves. Most of the teachers that did not have any writing aids available at school said they would be happy for the children to bring their own. 60% said that their school provided left handed scissors, but only 5% said there was any specific training for lefthanders in how to use them. None mentioned that you need to cut curves in a different direction left-handed. 32% said they were happy with the level of support for lefthanders in their schools, which leaves 68% NOT happy, with a fair number only coming to that conclusion AFTER reading our survey which made them think about it at all. 93% of those who answered said they would be interested to see our guidance notes on helping left-handed children when we issue them. The survey really just reinforces the points we put in our initial article and which we have picked up from our regular correspondence with parents and the comments on our website articles. Teachers are generally not given any specific guidance on helping left-handed children either during their training or in schools where they teach. There are only likely to be any school policies on teaching lefthanders if a left-handed teacher happens to be involved in the process of creating them and has their views listened to. Most teachers do not give specific help on writing for left-handed pupils and given the large number of left-handed teachers in our sample it is likely to be worse overall. Left handed scissors are provided in 60% of schools but the children are generally not shown how to use them properly. 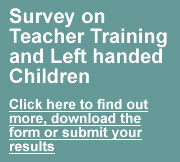 Nearly 70% of the teachers in our sample are NOT happy with the level of support provided for left-handed children and nearly all of them would welcome additional guidance on what they should be doing. We were hoping to find some good practice and some sort of documented guidance or policies to help teachers in this area, but we have found nothing so far. We were also hoping to mobilise some parent power to make this a large and influential survey but the response has been very limited so maybe this is just not something people are concerned enough about to want to help change things? Our plan now is to take the best of all the information on helping left-handed children from our own website and books and put it together as a short guidance note for teachers. We will also organise the more detailed information and videos on our web site to make them easily accessible from a single page and link to that in the guidance notes. We will complete this over the next month or so and plan to issue it in January 2013 and promote it with media stories and a “New Year Resolution” theme. The guidance notes will be available as a free download on our website and we will let you know in the Left Handers Club newsletter when they are ready. We will also keep the survey form open and continue to monitor responses.